Brad Spurgeon reports from Paris on efforts underway to define the post-3G generation of wireless networks, and quotes Calit2 division director Ramesh Rao as saying "the broad 4G issues include data speeds, network architecture and development of services for consumers." Catherine Zandonella reports on a "comprehensive roadside response system being developed by Mohan Trivedi and his team at the University of California, San Diego." The British magazine highlights Trivedi's "R2D2 lookalike" robot that is "designed to be first on the scene after a traffic accident" allowing for two-way video and audio communications." Based on university filings for fiscal 2001, Denise T. Ward reports that Calit2 was one of the three biggest recipients of private donations at UCSD. Web editor Amy Newman reports that an SGI supercomputer installed at UCSD as part of a partnership agreement with Calit2 will be used "on a wide variety of projects tied to Calit2's mission of extending the use of the information technology infrastructure… [including] using the data center to gather and immediately analyze real-time earthquake activity." Staff writer Katie Burns reports that Calit2, "which might help lay the foundation of the wireless Internet, has a steady flow of investments from government and industry despite recent woes in the technology sector." UCSD division director Ramesh Rao is quoted saying wireless will be key to the future Internet: "We see the Internet, which is today largely composed of computers that are networked together, morphing together in lots of small devices in embedded systems." Calit2 "is giving itself high marks on its mid-year report card," writes Jennifer McEntee. Reporting Gov. Gray Davis' signing of the 2001-2002 budget that includes $25 million for the institute, she adds that Calit2 reached $47 million in funding deals with industrial partners. Director Larry Smarr is quoted saying, "People might have thought the first thing companies would do under this financial pressure is throw overboard any money they were planning to give to educational institutions. Instead, the companies believe they are going to get a good return on this investment." The local business newspaper reports Calit2 signed SGI Inc. (formerly Silicon Graphics) as an industrial partner, noting a co-investment already worth $210,000 in a visualization system for the institute. 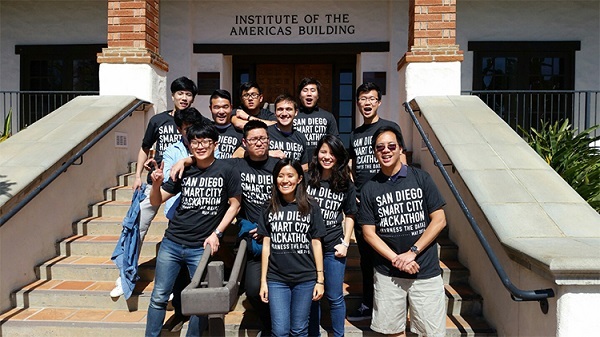 The story was also picked up in the Sept.17 San Diego Business Journal and the July 28 Supercomputing Online news service. Kevin Coleman reports on Larry Smarr's many successes, and about his current position as director at Calit2. He writes, "California Institute for Telecommunications and Information Technology is a natural evolution of Smarr’s inspiration to advance technology by combining the efforts of university, government and private industry. Debra Richardson, Chair of ICS-UCI, and Calit2 participant recognized as for her leadership and commitment. William Schulz reports on Calit2 being one of the " four multidisciplinary California Institutes for Science & Innovation (Cal ISI)--all to be located within the University of California system...Scientists carrying out the governor's plan have a word for it: visionary." Tom Matrullo covers Calit2 in the Telecom & Wireless section. TECHNOLOGY'S NEXT STEP: Sensors will move "Internet's evolution into physical world"
Bradley J. Fikes reports on Larry Smarr's mission: "...to run a $300 million telecom research institute at UCSD and spread the word of his wireless vision for San Diego."